They'll see it's made with love but not how many veggies are in it! In a food processor, combine the onion, garlic, celery, green pepper and carrot. Pulse until finely chopped. Place mixture in doubled up paper towels. Squeeze the excess liquid out. In a large bowl, combine the turkey, vegetable mixture, eggs, oats, ¼ cup ketchup, steak sauce, salt and pepper. Mix well. Place in a baking dish or on a baking pan. Shape the meat into a heart shape 2 inches thick. Spread the 2 tablespoons ketchup over the top of the meat, leaving ¼-inch border without sauce. Bake for 55 minutes to 1 hour and 10 minutes, or until the internal temperature reaches 165°. Allow to rest for 10 minutes before slicing and serving. 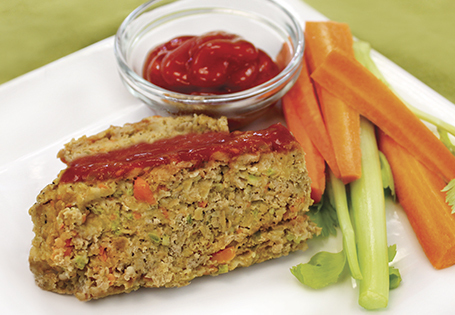 TIP: Kids love dipping this in extra ketchup!